Though there are many brilliant Indian restaurants open across London, Calcutta Street is set to bring a Bengali home dining experience like no other to Fitzrovia this month. Opening in an area that’s home to so many new restaurants, Calcutta Street is the first permanent space from Shrimoyee Chakraborty, following a string of successful pop-ups. Split into two sections; the ground-floor ‘no reservations’ space will focus on smaller tables and casual gatherings around the kitchen island bar, while the downstairs dining room, available for both bookings and walk-ins, will offer a unique experience that’s heavily inspired by Bengali home-dining. Each evening at either 7pm or 9:30pm, up to 20 diners can be accommodated and seated around two communal tables to eat, drink, socialise, and indulge in a menu of shared dishes, with endless breads, rice, chutneys and pickles. As for the food on offer at Calcutta Street, the chef’s recipes have been passed from mother to daughter for generations and are generally family recipes, albeit made here with some of the best British ingredients available. 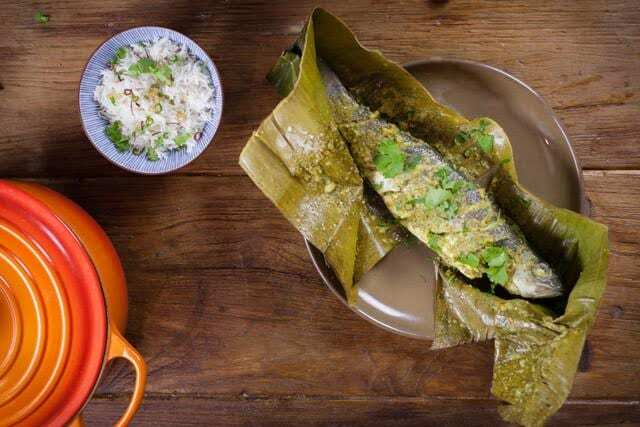 One particular menu highlight is Chakraborty’s fish paturi – a Bengali fish dish, featuring whole sea bass that’s wrapped in banana leaves and steamed. And in accordance with the impending launch, the recipe for the dish has been shared, setting the precedent from what’s to expect from one of this month’s most exciting new restaurant openings. Marinade the fish with lemon juice and salt for 15 minutes. Place the marinated fish on the banana leaf. Mix the fresh cream, mustard oil, mustard paste, fresh green chilli paste and grated coconut together in a bowl. Pour this paste on to the fish. Sprinkle the zest of lemon on top. Wrap up the fish in banana leaves and tie it with string. Open the string and sprinkle some freshly chopped coriander. Calcutta Street is set to open soon and can be found at 29 Tottenham Street, London, W1T 1RU.